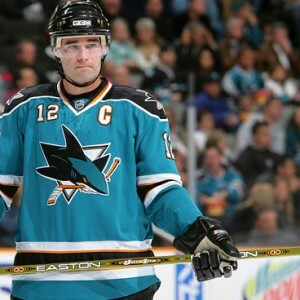 End of the Patrick Marleau Era in San Jose? 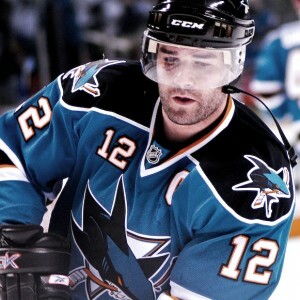 Patrick Marleau played his first NHL game for the San Jose Sharks at the age of 18 years and 3 months. In the 18 years and 5 months since, Marleau has been a continuous presence in teal, establishing himself as one of the league’s elite players. Not surprisingly with his combination of tenure and talent, Patrick Marleau holds numerous San Jose records. His time in San Jose may be coming to an end. Marleau is the Sharks all-time leader in goals, points, games played and consecutive games played. He leads in even-strength goals, power-play goals, short-handed goals and game-winning goals. He sits less than 25 goals from reaching the 500 mark, it appears he will be just the 45th player to get there. It is very possible Marleau finishes his career inside the NHL’s top 30 all-time goal scorers. But this legacy does not override the needs of the present. Marleau is performing at perhaps the lowest level of his career. This is not a ‘moment in time’ issue, but two full seasons worth of performance. Combine this lower quality of play with his expensive contract, and the Sharks have a problem. Marleau’s scoring numbers, 22 goals and 44 points this season after 19 goals and 57 points last year, are well below his career averages. They look disappointing, but not disastrous. Take out the power-play contributions, however, and the drop-off becomes stark. Last year, Marleau finished with 33 points outside the power play, this year it is only 21. In the last five full NHL seasons prior to these last two, the non-power play point figures were 53, 58, 47, 39, 47. His non-power play production is less than half. Further, in all five of those seasons, Marleau potted at least 20 non-power play goals. Last season and this, it has been 12 and 12. He is a goal scorer who is no longer scoring many goals. Alas, it is not merely the scoring drop-off that has been a problem. For all the controversy over the plus/minus statistic, more often than not, it tells a story. There is no subtlety here. Marleau finished worst on the Sharks in the prior season at minus-17. He’ll finish worst again this season. He is now at minus-23 and will set a career low when the season comes to an end. There are 507 NHL skaters who have played at least 50 games, Marleau is ranked 502nd in plus/minus. If we crop that group to the 250-plus skaters that will play in the playoffs, Marleau is ranked last. The bad news continues. Marleau has a history of being an asset short-handed. This season, he is second worst on the team in goals allowed per 60 minutes of short-handed ice-time. Last year, he was also second worst. The only aspect of Marleau’s game that is not overtly a problem is his participation on the power play, where he and the top unit are producing at levels comparable to prior seasons. Even there, the other four players on the top unit are elite offensive producers; it would likely be productive with or without Marleau. There are players whose primary skill is creating holes and cracks in a defense, others whose primary skill is making sure those holes and cracks result in scores. One creates opportunity, the other cashes in. Longtime teammate Joe Thornton is the former, Marleau is the latter. Marleau doesn’t create much for others. When others create chances for Marleau, he has been among the best at finishing the play by turning chances into goals. Marleau has a variety of skills that made him a talented goal scorer. He has a good shot, but wouldn’t be considered a sniper. He is a player who anticipates well, then uses his speed and savvy to get to the right spot. His series-ending goal against Vancouver in the 2013 playoffs is an example. All three of his goals in his 2009 hat trick against Edmonton fall into this category as well. Marleau’s speed has been another source of his productivity, especially in open-ice situations where very few defenders can keep up. Marleau has an elegant efficiency to his movement. Though not overly physical, Marleau is a big player, yet he accelerates and moves like a sprinter. There is a lot of power in his movements. This combination in open ice has been a major contributor to many goals, especially after turnovers where his ability to read the play and transition from defense to offense creates challenges for opponents. These links give two video examples, one against Vancouver, the other against Phoenix. Another key Marleau asset is a great touch around the net. There is an old hockey mantra to get pucks to the net. Great goal scorers don’t simply get pucks to the net. They make the quick extra move like changing the angle on a shot to make the goalie’s job much more difficult. Marleau has that skill as well. Marleau’s core value has been as a goal scorer. Other aspects to his game matter and while he isn’t elite in other areas, he hasn’t been a liability either. Does it matter what has caused Marleau’s decline? I think so. Causes matter because optimizing his current abilities is best for both the player and team. In prior articles, I have analyzed Marleau’s in-season decline in detail with plenty of data. I won’t rehash or give detailed updates here (using this link or this link will get that data and analysis). It is safe to say the trend continues. Since the calendar turned to 2016, Marleau has only one even-strength goal and one short-handed goal, the rest of his goals are on the power play. I have long considered excessive ice time a major part of Marleau’s decline. There is nothing about this season that would lead me to a different conclusion. Marleau currently ranks 16th in ice time among NHL forwards and is just one of eight in the top 20 to have played over 100 short-handed minutes, the toughest minutes. No other team uses 36-year olds like San Jose does. Heck, very few teams use 32-year olds like San Jose uses Marleau. I wrote before about what I would consider a full workload for a 36-year-old player like Marleau. Play 78 games averaging 17 minutes of ice time per night (1326 total minutes). Marleau is on track to play over 15 percent more ice time than in the 78/17 plan, the equivalent of 14 NHL more games worth of ice time. Among the players who play similar ice time to the 78/17 plan are Jarome Iginla, Pavel Datsyuk, Ryan Callahan, Jakob Voracek, Brandon Saad, Jason Spezza and Shane Doan. It is good company. One other factor, Marleau currently has the NHL’s third longest active consecutive games streak, having passed the 500-game mark in January. No doubt it is a source of pride. Perhaps it also constrains the coaches from taking Marleau out of the lineup for either performance reasons or just to give him some rest. Another potential source of Marleau’s struggles might be his linemates. As discussed earlier, Marleau is a finisher, the sort who benefits greatly from having others create offensive opportunities. This season, Marleau has been on the ice with Joel Ward 77 percent of the time. Next up is Matt Nieto at 33 percent and Tomas Hertl at 20 percent. Last season, it was Logan Couture 72 percent, Tommy Wingels at 34 percent and Nieto 33 percent. While some could argue (and I have) that Nieto is a bubble NHL player, the others are not. My contention with Marleau’s linemates is not a lack of talent, but a lack of chemistry. In a prior piece, I wrote about the importance of set-up men for the Sharks, the natural complement to a goal scorer like Marleau. 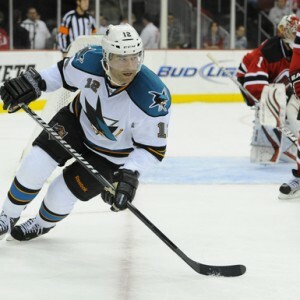 In the past two seasons, he has not played much with the Sharks’ set-up players. Marleau has lacked chemistry and effectiveness with several different linemates, and most are very good NHL players. This suggests linemates are not the core problem. And while Marleau may be known first as a goal scorer, he has other skills. This link shows him stripping the puck away from an opponent and making a tape-to-tape pass to the goal scorer. These aspects of his game have not re-emerged since his move to center. I find it troubling. Marleau has spent considerable ice time with several good players the last two seasons, but has not been very productive. I do think chemistry is an issue. Still, Marleau has failed to adjust effectively, something one would expect an experienced and talented player to do. Even if his linemates have not been optimal, the results should have been better. I’d suggest his lack of chemistry with his linemates is a contributory factor, but not a major one. Over the years, there has been plenty of comment about Marleau’s intensity. It is not something new. People have said Marleau doesn’t play with much fire, except when he wants to and then only for relatively short periods. 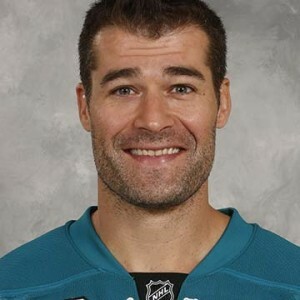 Marleau’s facial expressions rarely convey the sort of emotion and intensity common to hockey players. Reinforcing this perception is Marleau’s lack of physicality on the ice. In the last three seasons, over 240 games, Marleau has a meager 40 penalty minutes. Joe Thornton has 54 just this season. If you are playing hard, physical hockey, penalties happen. Still, all this is speculation and while there is evidence, other explanations also come into play. For example, last season Marleau was among the league leaders in ice time. He also had only one first period goal all season. It is possible that Marleau, knowing he would play big minutes, managed his energy in the opening period to save himself for later in the game. Managing energy is not the same as lack of desire, even though they may appear similar. There is a case to be made regarding Marleau’s effort. A recent play on the wall against Edmonton serves as an example (just past the 1 minute mark on this video link). People see lack of effort, I see a player trying to manage his body by trying to take the less punishing way out. It may be a distinction without a meaningful difference. In terms of citing lack of desire or lack of effort as a cause of Marleau’s decline, I’m not going there. I recognize others will. They are not without evidence. Athletes age and skills diminish. Marleau’s differentiating skill for most of his career has been his ability to finish. The difference between being a great finisher and merely being dangerous comes down to things that are almost imperceptible. Making that extra move, where four moves makes you dangerous, but its the fifth move that gets the goal. Release a puck one hundredth of a second slower and a defender’s stick alters the shot. Get to a critical spot on the ice less than an eye blink too late and the puck just misses being on your tape for a rebound shot. Marleau has spent most of his career on the right side of these situations. I have seen flashes of the old Marleau. Those flashes are fewer and further between, but the top-end skills are still there. Do I think his skills have lessened? Yes. A lot of times this year, Marleau’s play has been effective and he has looked dangerous. To me, he is missing that extra move which turns a dangerous scoring chance into an actual score. He is that one or two hundredths of a second slower in making his read or in getting his shot off. A few seasons back, when Marleau was dangerous, the puck made it into the net. Now he is dangerous, but the puck stays out. When I look at Marleau’s shot-attempt numbers the past two seasons, they are middle of the pack for his career. When I look at shooting percentage, they are at or very near the worst of his career. In the last 15 seasons, Marleau has only been below 11 percent on his shooting percentage three times. He was at 10.3 percent in 2007-08. Last year, he was all the way down to 8.2 percent and he is at 10.5 percent this season. Marleau is getting enough shots, but he is no longer finishing. Marleau’s diminishing skills is a problem exacerbated by his wildly excessive ice time. To a lesser extent, I think his linemates, notably the lack of a quality set-up man, is a contributing factor. Two of the three factors are fixable. In prior articles, I’ve been hard on Sharks management for the manner in which they have used Marleau. I see no evidence that would cause me to think differently. More modest ice time on lines with at least one of the Sharks better set-up players (Joe Thornton, Joe Pavelski, Joonas Donskoi and Chris Tierney) could be very beneficial to both Marleau and the team. A major part of the Sharks’ problem is the gap between Marleau’s contract and his performance. Marleau’s salary cap hit is $6.67 million. In a league with over 500 skaters, his contract carries the 39th largest cap hit in the league. His plus/minus is 502nd out of 507 skaters with over 50 games played. It is a big gap. Other than the cap hit, there are two important contract considerations. His contract has one more season and Marleau’s deal has a no-movement clause, so any movement would need his approval (there is more detail on his contract in this linked article). There are four options. Marleau can retire. He can get traded. He can be bought out. He can stay in San Jose. I suspect retirement is not on the table, the rest are. Aside from contract and performance, other factors will play a part in determining the path forward. One wild-card issue revolves around NHL expansion. Should the league add a new team (or teams), which seems likely, the process could have a significant impact on San Jose. I covered the evolving scenario in the article on Marleau’s contract. Ironically, his contract could become a positive asset, helping the Sharks protect other roster players in an expansion draft. This is a case where the devil is in the details. The details will be determined in the next few months. The performance in the postseason by both the team and the player can certainly have an impact. If the team fails to get out of the first round, the Sharks may be looking for a new general manager. The business side should not be ignored. Taking Marleau out of San Jose does risk alienating part of the fan base. Fan attendance is already on thinner ice than management would like. While I am skeptical Marleau is a major revenue source, if a parting turned ugly, it would not help the Sharks. Marleau currently has more goodwill than Sharks management, who squandered much of their goodwill a year ago. Even weighing all the pros and cons, Marleau’s future in San Jose is much like a personal relationship. There is an emotional part to it. How much does Marleau want to stay in San Jose and how much does the team want him to stay? Marleau holds more cards in the relationship with the no-movement contract clause; his family and relationship with the community might overwhelm every other factor. Another season that mirrors the prior two seasons should not be acceptable to either the player or the team. Something must change. I’ll offer no prediction on whether Marleau leaves San Jose, but it is clearly an option. Maintaining the status quo is not an option. I think the parties, the player and the management, have a pretty good idea the direction this is headed based on certain assumptions. Should upcoming events deviate from these assumptions, a change in direction may be possible. To close, I will suggest my choice for a path forward (and to readers who stuck with this lengthy article all the way, let me add my appreciation to you!). Absent clarity on the expansion issue, my take on Marleau is this. I would be very hesitant to ‘sell low’ on Marleau. He is a good hockey player and he is being misused. 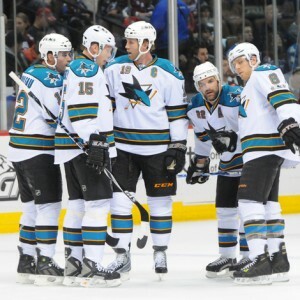 The Sharks should use next season to make changes which benefit the player and the team. They didn’t really try this season. The Sharks need to stop making this mistake. I would alter his role with the team to a role aligned with his current ability. Marleau has been steadily working his way down in the lineup. Next season, I would consider starting him at the bottom and seeing if he can work his way up. If there is distinct improvement in an altered role, I keep him and consider extending him on terms that fairly value him in his altered role. If there is no improvement, I move on at some point during next season. For the now, my choice is to forget what needs to be done in the offseason. The Sharks’ regular season is down to the final and largely meaningless week. This somewhat quieter moment is a good time to appreciate 18 years of contributions from one of the game’s better players. I prefer to take that opportunity while Marleau is a Shark. Since it may not be for much longer.